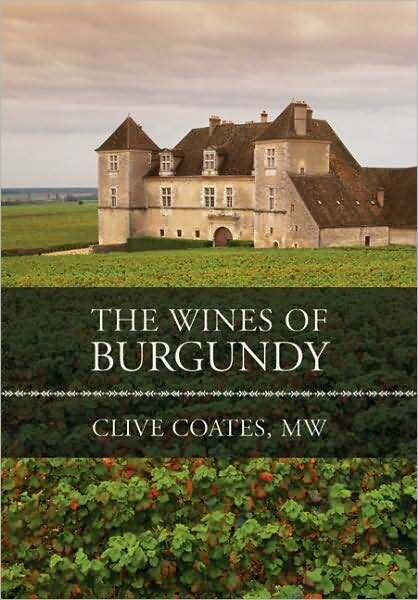 Clive Coates is one of the most respected authorities on the wines of Burgundy holding the prestigious Master of Wine title and having lived in Burgundy for several years. His 878 page tome “The Wines of Burgundy” is a must-have for anyone with a love for this complex wine region. The book is major expansion of his 1997 book “Cote d’Or: A Celebration of the Great Wines of Burgundy” with hundreds of new tasting notes and all the regions of burgundy including the Cote Chalonnaise. The book begins with a thorough introduction for those new to the Burgundy region which is well worth the read. The heart of the book however is the detailed review of each appellation in Burgundy covering a brief overview key facts and terroir and then moving directly into a review of several hundred producers. Mr. Coates unique style is at once informative and humorous. He easily flows from comments on the quality of the wines themselves and which to buy to the personality of the vintner and sometimes even the attractiveness of his wife. All this serves to bring the reader into the vineyards of Burgundy to help them see and feel a land that Mr. Coates is obviously very passionate about. If you are a serious Burgundy fan or would like to become one this wine book is absolutely indispensable and despite it’s size quite readable and enjoyable.